The controversy over Rep. Ilhan Omar’s reference to the 9/11 terrorist attacks continued to boil on the political talk shows on Sunday. The comments made by Omar, one of the first two Muslim women elected to Congress, have been widely dissected. We thought it would be helpful to our readers to provide the context for Omar’s comments, which were made during a 20-minute speech she delivered at an annual Council on American-Islamic Relations event in California on March 23. Omar’s speech came a week after a gunman opened fire at two mosques in New Zealand on March 15, killing at least 50 people. Omar said that despite trying to be good neighbors, Muslim Americans are often made to feel like second-class citizens. That was immediately followed by the sentence with the phrase that is the subject of the recent controversy. Some seized on Omar’s use of the phrase “some people did something” to refer to the terrorists and the 9/11 attacks, and suggested she was trivializing the attacks. Trump joined those critical of her comments with an April 12 tweet that said, “WE WILL NEVER FORGET!” His tweet included a video that starts with Omar’s clipped comment — “CAIR was founded after 9/11 because they recognized that some people did something” — followed by gruesome scenes of the 9/11 attacks. The 43-second video, which has been viewed more than 10 million times, repeats her phrase “some people did something” several times interspersed with footage of the attack and wreckage. 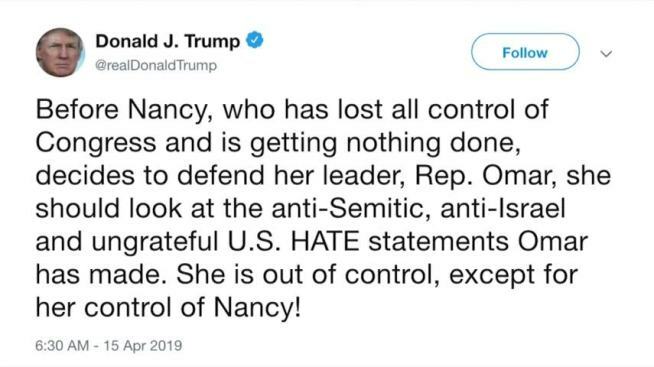 We could not find that Omar has commented directly on the accusation that her words trivialized the attack, but she retweeted several defenders who said her comments were being manipulated and used out of context. In one tweet, Mehdi Hasan, a columnist at the Intercept, wrote, “She didn’t trivialize 9/11, she pointed out that Islamoohobes like yourself use 9/11 to smear all Muslims.” In another, Rep. Ayanna Pressley wrote that Omar’s “full comments clearly speak to post 9/11 #Islamophobia” and that “Manipulating her remarks is defaming & dangerous for her & her family.” And Rep. Alexandria Ocasio-Cortez noted that Omar is a cosponsor of H.R. 1327, a bill that seeks to fully fund the September 11th Victim Compensation Fund. In the sentence in question, Omar pushes her hand away from her when she mentions “some people” — presumably to emphasize that it was a few Muslims who had “done something” — and she then twirled her fingers in a circle when referring to “all of us” losing “access to our civil liberties” as a result. Again, we will leave it up to readers to determine for themselves the appropriateness of her words.